FOR: Fans of Scott Westerfield, especially Uglies, or The Hunger Games. Anyone looking for an excitingly fresh cyber dystopian. In the Community, there is no more pain or war. Implanted computer chips have wiped humanity clean of destructive emotions, and thoughts are replaced by a feed from the Link network. When Zoe starts to malfunction (or "glitch"), she suddenly begins having her own thoughts, feelings, and identity. Any anomalies must be immediately reported and repaired, but Zoe has a secret so dark it will mean certain deactivation if she is caught: her glitches have given her uncontrollable telekinetic powers. As Zoe struggles to control her abilities and stay hidden, she meets other glitchers including Max, who can disguise his appearance, and Adrien, who has visions of the future. Together, this growing band of glitchers must find a way to free themselves from the controlling hands of the Community before they’re caught and deactivated, or worse. 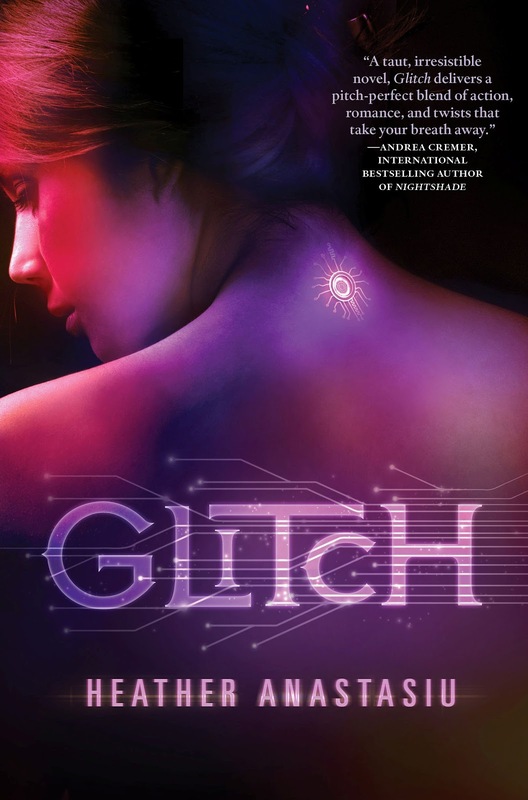 In Heather Anastasiu's action-packed debut, Glitch begins an exciting new young adult trilogy. The Basics: I enjoyed this book more and more as I continued reading. The premise is a clever twist on your classic corporation-rules-the-world dystopian and is no more implausible scientifically than most distant-future sci-fi. Some of the phrasing continued to grate my nerves throughout, but it was a small price to pay for a relatable main character, strong supporting cast, and exciting plot. It dragged a little in the middle, but then regained its momentum and never let up. Anastasiu is a master of unexpected twists. This is one of the first YA books in a while that has truly surprised me. I can’t wait for the sequels! Plot (5/5): Not to sound like a complete snob, but it’s difficult for most YA books to truly surprise me. Usually I have an idea of where the author is going from page to page. Sometimes I may be momentarily shocked, but usually, in the best books follow as I’d expect them to. Glitch took all of my expectations and crushed them into tiny little balls, then laughed at them. So you think she’s going to escape here? Ha ha, you silly reader! It’s so much more complicated than that. So you think you know which side this character is playing? Oh no, you’ve missed all the little clues! Everything made sense once you looked back on it, but I always found myself running into exciting surprises. There was a lull in the middle bit, but not enough to tarnish the breakneck awesomeness that is the rest of the book. Concept (5/5): Mind control isn’t new. Dystopian isn’t new. Creepy dictatorships aren’t new. But Anastasiu puts them together in a very exciting and thoughtful way. The V-chip is a device wired into the brains of Community subjects, used to diminish their emotions. It’s a very interesting way of looking at a dystopian world. To render peace, get rid of the passions! Get rid of what makes humans human! I still find it difficult to believe that they could wire the brain so intricately, even with future world technology, but I was willing to suspend disbelief. Characters (5/5): Zoe is so fun to read about. She’s your average teenage girl but in all the good ways. She’s not particularly brilliant or resourceful. She gets confused a lot. She’s having a difficult time dealing with all her newfound emotions. She’s just so determined that she must succeed, or die doing it. She’s scrappy and I like that. She also doesn’t master her powers very quickly or easily, and I appreciate that she’s not expert at them even at the end. The supporting cast is mostly great. Molla is a bit of a throwaway, but I look forward to meeting her more in the later books. Max and Adrien are both well fleshed out. It’s a love triangle, yes (and you know, if you read my reviews, my rageful feelings towards love triangles) but in a very unconventional way made so awkward by the fact that these teens don’t really know what emotions are! Which is hysterical. Style (5/5): Clear and clean, no real complaints here. I adore the dialogue surrounding the characters’ discovery of emotional expressions. Imagine that you had no idea what emotions were your whole life, then during high school, you suddenly began feeling all sorts of strange things. Watching Zoe feel this sensations and try to put language to it is hysterical. I actually laughed aloud when Max asked, “Can I see your genitalia?” Like a scientific robot who doesn’t really understand the repercussions of such a thing. It makes you think about life in such a new way. Mechanics (4/5): Typo-free and well formatted. I had some personal issues with just a few things. One, the profanity just sounded ridiculous. It’s difficult for authors to make up fantasy or future slang without it sounding over-the-top, and Anastasiu just missed the mark on this one. Shunting, godlamed, cracking hell, etc. It just didn’t sound quite natural. The names were also a bit odd. Why did she have to be Zoel? Why not just make her Zoe from the beginning? And Markan? Maximin? Daavd? Some of them would be unpronounceable to the English-speaking tongue. Others just don’t seem to fit into the same language. I’m a bit nitpicky about my languages though, so take it well salted, as the citizens of Westeros would say. Take Home Message: A fast-paced, clever dystopian with a hero you could really root for and a lot of humor. Note: I received this copy for free from St. Martin’s Griffin in exchange for a review. The price of the book and its origin in no way affected my stated opinions.